The perfect symbol of love or friendship. This personalised silver necklace has an alphabet letter charm with a pearl and Swarovski crystal cluster. Complete with pearl stud earrings. This gorgeous collection is all about pretty, dainty gifts with a special personal touch. It is complemented by a Swarovski crystal and pearl cluster. You can select the colour of the Swarovski crystal, which come in a myriad of different colours, as you can see from the images. If you can not see the one that is perfect for you please email and we can try and find it. Not all the colours shown are listed in the options. The standard colours are those shown in the image with all the cluster charms. The pearl in the cluster is either black or white and the pearl stud earrings will match the colour you select. The crystal and pearl cluster are separate from the letter charm. 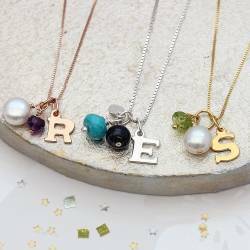 They can be removed from the chain so you can wear just the initial on its own, or just the cluster on its own or both together. 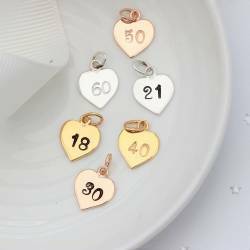 Additional charms can be purchased separately under the accessories tab above. Once we’ve created the perfect personalised necklace and earring set for you, we’ll carefully package it in one of our beautiful black gift boxes with a gift card. We’ll then finish it with a flourish of ivory ribbon ready for you to give to the lucky lady. To make your gift extra special, we also offer a luxury gift wrap service. Orders can be wrapped in luxury black and gold paper and finished with a black satin bow and gift card, or silver paper finished with lilac satin ribbon and silver gift card. There is a small charge per item for this service. Sterling silver, freshwater pearl, Swarovski crystal. The sterling silver box chains are available in 3 lengths: 16"/40cm, 18"/45cm and 20"50cm.